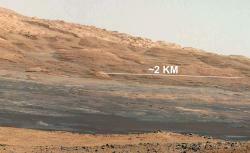 Curiosity Mars Rover sends back mount sharp hi-res images and beams audio of NASA administrator’s human voice. Mars Curiosity Rover has sent back some high-resolution images of Mount Sharp that look pretty, well, sharp. The images of the three-mile-high mound of layered rock surprised scientists, who realized it has tilted layers rock, similar to the Grand Canyon on Earth, that are most likely the result of physical processes like wind or water. But that wasn’t the only treasure sent back from the Red Planet. Curiosity also just beamed back the audio of a human voice—an interplanetary broadcast first. NASA Administrator Charlie Bolden’s message sounded something like a Star Trek intro: “Since the beginning of time, humankind’s curiosity has led us to constantly seek new life … new possibilities just beyond the horizon.” But it also had practical meaning: testing some of the rover’s new broadcast equipment. In this photo provided by NASA, a view of the lower reaches of Mount Sharp is shown in a cropped image taken with a 34-millimeter Mast Camera on NASA’s Curiosity rover on August 18, 2012 on Mars. If everything goes as planned, Curiosity will make its way out to Mount Sharp within a year, digging down to determine the chemistry of the hills and valleys and assess the Red Planet’s habitability. For now, some awe-inspiring multimedia is reward enough.